Foot odor is caused by bacteria, which love moist, dark areas. It is essential to keep your feet and shoes clean and aired out to prevent shoe odor from occurring. Wash your feet thoroughly with antibacterial soap, and scrub between your toes. Add a few drops of Tea Tree oil to the water as it has antibacterial properties. Dry your feet completely after washing. I like to use a hairdryer for quickness!! Use antiperspirants for feet to control moisture if your feet sweat excessively. Only use antiperspirants specifically designed for feet rather than underarm products. You can also apply antibacterial gels to your feet to control bacterial growth, or antifungal powder to prevent athlete’s foot. Wear absorbent socks, such as cotton, and avoid nylon socks, which don’t absorb sweat very well. Change socks once or twice a day if your feet sweat a lot. Wear shoes that breathe, such as sandals or shoes made from mesh and canvas. Allowing your feet to air out reduces bacterial growth. 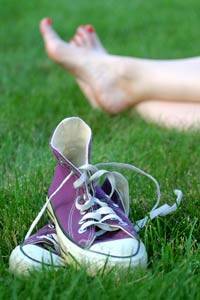 Avoid wearing shoes two days in a row, let them air out for 24 hours between uses. Remove the insoles and allow them to air out for 24 hours after an excessively sweaty day, or if your shoes get wet. If you wear your shoes without socks, shake in a bit of talcum powder to absorb sweat. Let you shoes dry completely before wearing them again.